Almost a year ago, my oldest son and I took my daughter to a birthday party that was quite a distance from our house. It was around dinner time, so I told my son we were going to eat at a restaurant instead of going home. I really didn't think much of this decision, it was made in an instant, only because I felt driving home to drive back a short while later would be a waste of time. Since that day my son has said numerous times, "Hey Dad, remember that time when we went out to dinner and ate all those pancakes." Every time I reply, "I remember," and he then says, "Yeah, it was just you and me. I liked that." I thought about this experience when I read this quote by Charlotte Zolotow when she described that a good picture book, "should extend a child's understanding of the world and it must be done from the point of view of the child. It should first of all be a well-written piece of literature, and it should help children understand the world better, their own inner conflicts, their own family, the things closest to them, problems they sometimes think belong only to them." (CCBC). 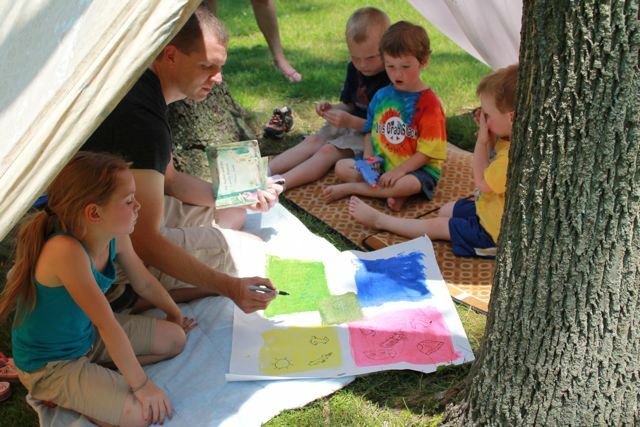 As a father of four children, I need to look at situations from my children's perspectives, give them experiences to learn about the world, and opportunities to express their feelings. Charlotte Zolotow celebrates her 98th birthday today! Her amazing career began back in the 1930s as a secretary to editor Ursula Nordstrom at Harper Junior Books. 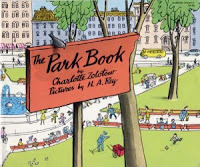 It was Ursula Nordstrom that published Charlotte's first book, The Park Book, illustrated by H.A. Rey. According to Charlotte Zolotow's website, Charlotte suggested to Nordstrom that Margaret Wise Brown, one of Nordstrom's clients, should write a book about 24 hours at the park. Nordstrom asked, "Just what do you think is so special about the park?" Charlotte's response must have been good because Nordstrom said, "You've just sold your first children's book." (Charlotte Zolotow.com). Charlotte went on to publish more than 70 books for children as an author and brought many other books to the hands of children as an editor. She spent 38 years at Harpers where she worked with many great writers including Paul Zindel, Patricia MacLachlan, and Paul Fleischman. Her contributions to the world children's literature are unmeasurable and her legacy is remembered each year with The Charlotte Zolotow Award that is presented annually to the author of the best picture book text published in the United States in the preceding year. 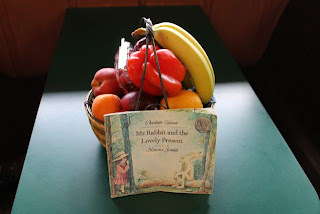 One of our favorite picture books we read this week by Charlotte Zolotow was Mr. Rabbit and the Lovely Present, illustrated by Maurice Sendak. I was excited to learn that it was Charlotte's birthday that helped a struggling manuscript about colors turn into the timeless classic that was awarded Caldecott Honor in 1963. Charlotte's young daughter wanted to get her mom the most lovely present for her birthday. Knowing this, Charlotte suggested, "Go up to the aqueduct (in New York) and pick a bouquet for me." Charlotte paired the idea of a child wanting to get the perfect present with her desire to write a book about the colors in a child's world. One more piece of this manuscript came later and that was of course Mr. Rabbit (click here to read the rest of the story). In Mr. Rabbit and the Lovely Present, the little girl asks Mr. Rabbit to help her come up with something her mother would like for a birthday present. The little girl tells Mr. Rabbit that her mother likes red, yellow, green, and blue. With each color, Mr. Rabbit gives suggestions for gifts, many of them are silly -- red underwear, yellow butter, a green parrot, and a blue lake. The little girl realizes that different colored fruits -- apples, bananas, pears, and grapes -- arranged in a basket would make the perfect birthday gift. I told my youngest son that just he and I were going to the market to get a "lovely present" for his mom and brother and sisters. 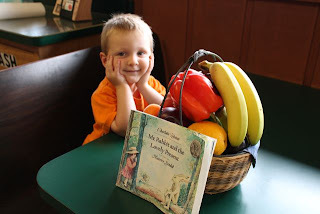 We reread Mr. Rabbit and the Lovely Present. Then, I gave him a basket and told him that he could fill it with any fruits or veggies. 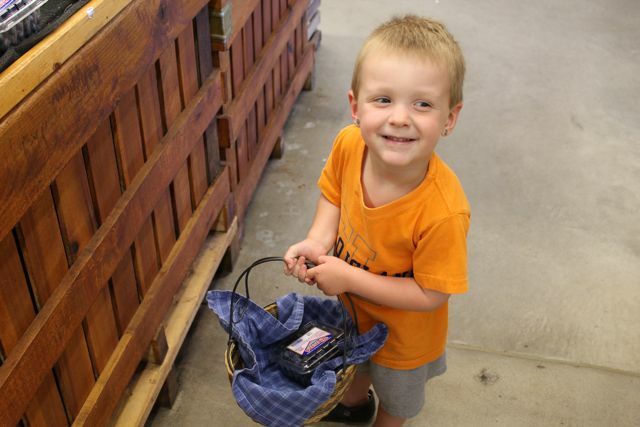 First, he put a package of blueberries in his basket. I thought he chose these because his brother really liked them, but later he explained that he picked them because he wanted to eat them! 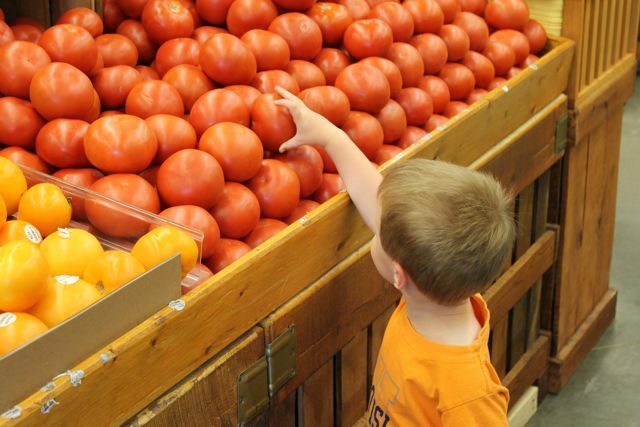 He reached for what he thought was an red apple, but realized it was a red tomato. He said, "I don't want this." He found lots of new fruits that he wanted to try -- orange apricots, reddish-orange nectarines, and purple plums. With all the new fruits his basket was getting pretty heavy. He also found many fruits that smelled really good like reddish-orange peaches and green limes. 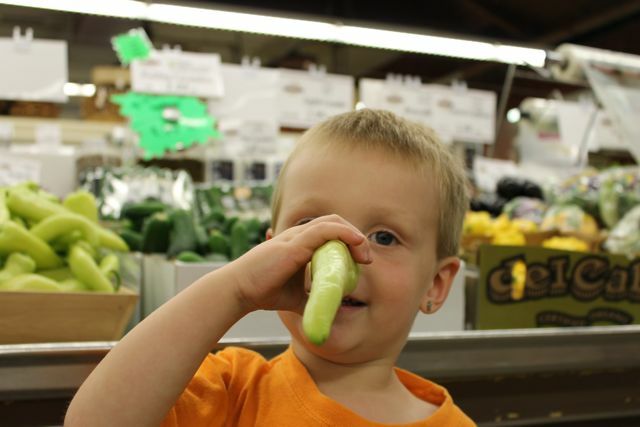 He thought this pepper looked like a witch's nose! 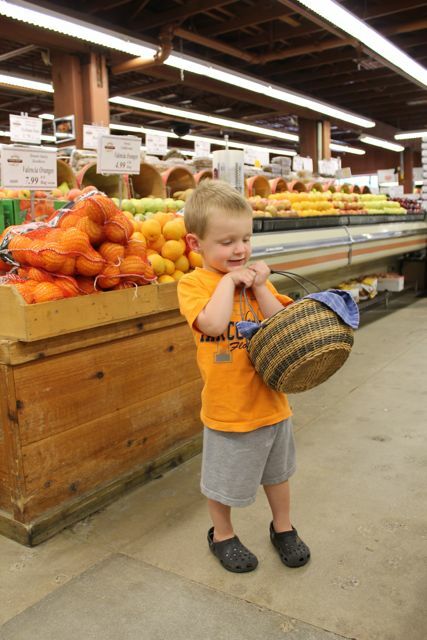 His basket was full after he added the yellow bananas! What a lovely present he put together! He was so happy with his selection of fruit. Take notice of the lone red pepper. 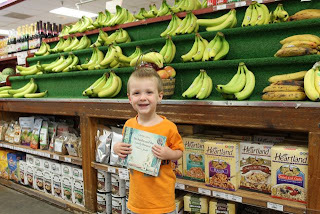 He wanted to get that for his big sister because he remembered that it was her favorite vegetable. 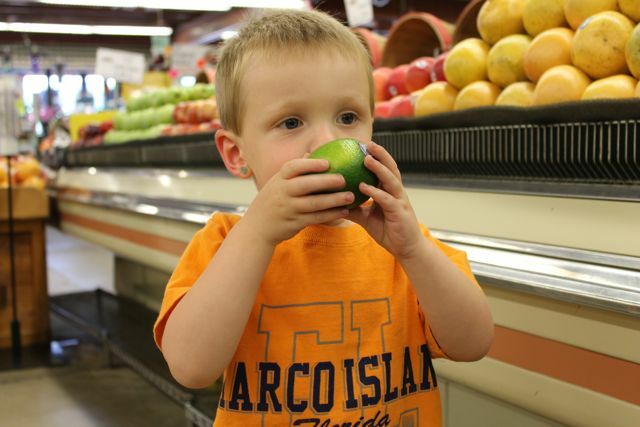 I never thought that going to the market could be such an enjoyable experience. 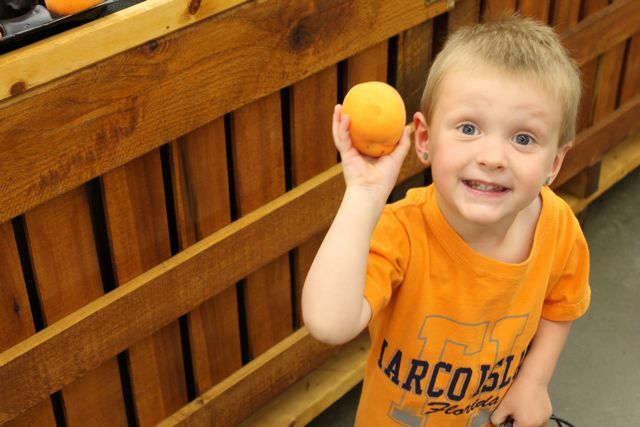 Thanks little man, for a great afternoon! I found this quote from Charlotte Zolotow on James Preller's blog "Things that matter to children -- that's what I try to get into my books. Things that are very important, even if they aren't important to the adults around them." As I read books like William's Doll, I Like To Be Little, and A Tiger Called Thomas this week to my children, their focused eyes and attentive body language told me that Charlotte succeeded at what she set out to accomplish. Thank you Charlotte for making books from the point of view of the child, books where my children can learn about the world around them, and books that have meaning and give them understanding! A photo from the first time I read Mr. Rabbit and the Lovely Present this week. I drew the suggestions from Mr. Rabbit on painted color boxes as I read the book.